She’s on the corner gazing into the wig shop, first the window on Haywood Street and then the one on Battery Park. 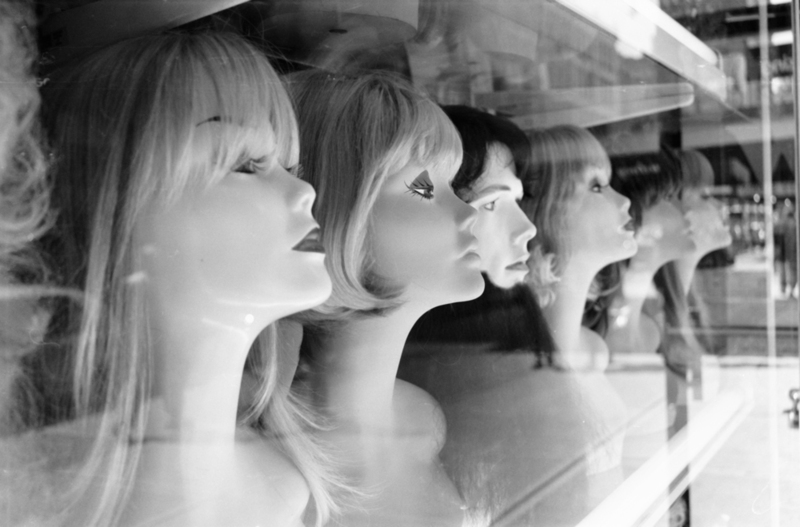 No doubt all the wig mannequins are jealous, under their stony stares, of her own smooth black bob. It’s a work of Louise Brooks perfection. She’s less vampy, less bowed of lip and smoldering of eye than the silent film star, but still able to convey an entire screen play in a few movements. Her walk is quick but fluid, pulling the bulk of her ankle-length coat closer to her frame, blocking the glinting cold of the morning. A ragged tail of skirt drags behind as she progresses up the sidewalk. Handle of a half-round frame purse in one chilly grasp, cigarette holder gracefully balanced between two fingers of the other hand. She exhales fog skyward and peers around, wondering how she got here. It’s apparent she took a wrong turn somewhere and wound up a block over and a world away from her intended destination. But this will do. Surely there is coffee somewhere on this street — and a splash of whiskey, if there’s any kindness in the universe — so she hurries on. Wigs already forgotten. Trail of smoke like a fast-fading apparition. This entry was posted in fiction, Writing and tagged bob haircut, flash fiction, wig shop. Bookmark the permalink.